The South Devon Railway was built to the designs of Isambard Kingdom Brunel and takes a route from Exeter along the River Exe to Dawlish Warren, runs beneath the sea cliffs to Teignmouth, and then follows the River Teign to Newton Abbot. It follows tidal waters for about 13 miles, 4 of which are open sea. The section was opened 30 May 1846 by the South Devon Railway Company, running from Exeter St Davids railway station to Teignmouth railway station and extended to Newton Abbot railway station on 31 December 1846. It was a broad gauge railway of 7 feet ¼ inch gauge and intended to be worked as an atmospheric railway, although atmospheric trains only ran from 13 September 1847 until 9 September 1848. The South Devon Railway was amalgamated into the Great Western Railway on 1 February 1876 and the gauge converted to the standard 4 feet 8½ inches after 20 May 1892. A station was opened to serve Dawlish Warren in 1905, all the other stations on the Sea Wall having opened with the line in 1846. The Great Western Railway was nationalised into British Railways on 1 January 1948 and the line is now owned by Network Rail. Running parallel to the open sea at the base of cliffs for four miles, the sea wall has always been prone to damage during rough weather. 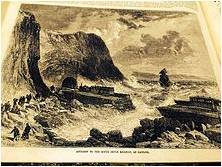 In December 1852 a large landslip from the cliffs east of Teignmouth caused the railway to close for four days, and in 1855 and 1859 the sea broke through the line at Teignmouth. There have been many more closures since, caused both by landslips from the cliffs and breaches by the sea, especially in winter. In 1929, the wall between Dawlish and Dawlish Warren was damaged by a storm on Christmas Eve, and there was partial subsidence of the down line. The most recent closure lasted two months following the storms in February 2014. Thanks to Wikipedia for the above extract.